As a bookstore manager working my way through college, my buying responsibilities meant I often met with publisher reps. These visits included briefings on upcoming titles—sometimes a formality, sometimes the source of a great discovery. 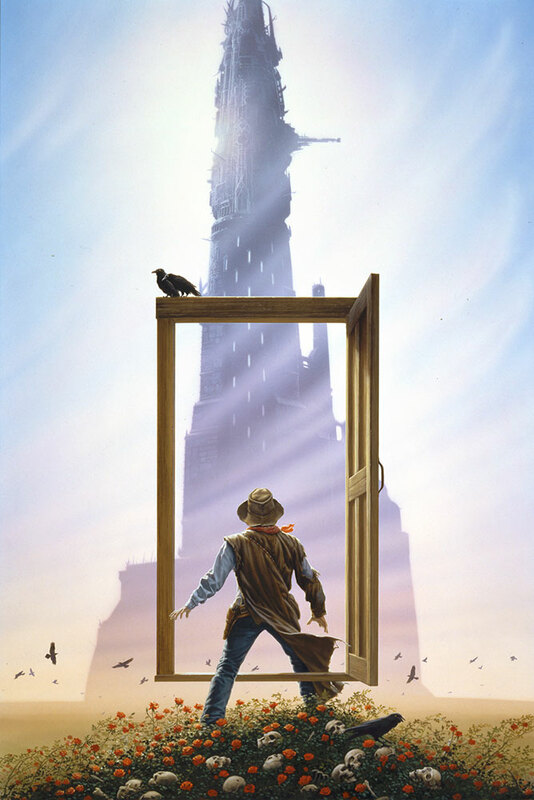 My formal introduction to Michael Whelan’s artwork began during a visit with Bantam Books. I’d always been a fan of sci-fi but until the enlightening conversation that day, I’d never put a name to the fantastic covers I’d been drawn to over the years. My friend and co-worker Russ Aceto had the same response poring over the flyer for THE ART OF MICHAEL WHELAN . Seth, our Bantam rep, ran to his car to grab a promotional poster—he only had a few and something in our awed expressions marked us as worthy. 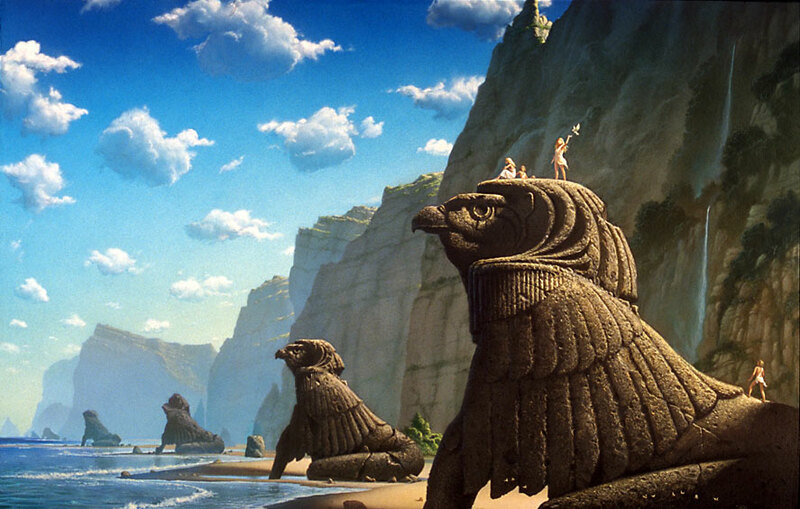 From first glance, Sentinels captured my imagination—the image of children on an enormous hawk-like sculpture, one in a line of stone guardians, overt symbols of war, crumbling along a long stretch of beach. I snatched up the book when it came out, of course, as did several co-workers. Over the years, I spent countless hours studying the images, interviews and accompanying text. That quintessential tome guided me to quite a few authors who would become favorites. 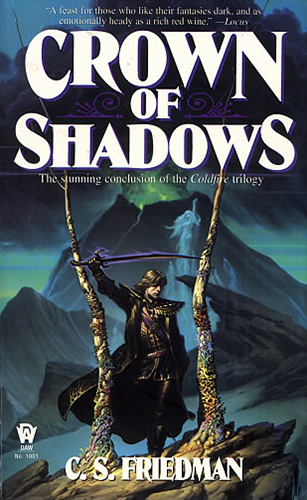 Just out of college and starved for fresh reading material, I tore through Tad Williams’ MEMORY, SORROW, AND THORN and Melanie Rawn’s DRAGON PRINCE and DRAGON STAR Trilogies in short order. Whelan covers kept jumping off the shelves at me—and not just when I was shelving in science fiction. One day I stumbled on a main aisle display of CROWN OF SHADOWS by C.S. Friedman. I couldn’t get the vibrant color or the elegant menace of Gerald Tarrant out of my head. Try as I might, I couldn’t find any of Whelan’s art online. The internet was about to mainstream at this point; supposedly the World Wide Web was going to revolutionize our lives—but there wasn’t much out there yet. That got me to thinking. Wouldn’t an artist of Whelan’s stature might like to present his work on the internet? I dashed off a letter, doing my best to suppress my fanboy gushing. To my surprise, Michael replied quickly and enthusiastically to the ideas presented. 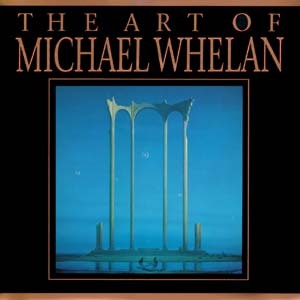 The first iteration of MichaelWhelan.com would be a modest endeavor, not much more than a simple HTML framework featuring ten paintings a month. I focused on putting out high quality images of the covers I enjoyed. 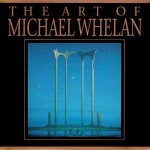 My original copy of THE ART OF MICHAEL WHELAN was soon cannibalized for high resolution scans. (Not to worry…it was later replaced with a limited edition copy). Michael was always gracious about the time I spent. Looking back, the design was cringe worthy. But he kept feeding me PhotoCDs and CD-Rs of his work. I couldn’t believe the breadth of imagery—there were so many paintings across a range of genres that it would take years to do his career justice. Eventually, I figured out the trick of web presentation, and the site took on a more polished look. In 1997, more than a year after launch, I flew to Cape Cod for the opening of Michael’s first one-man gallery show. There I was surprised to learn how much of an impact our site had. Using the website as a portfolio, Michael had presented his work to Julian Baird, the owner of Tree’s Place, while vacationing on the Cape. Most of the paintings sold before opening, and the success led Michael to focus on his fine art. I can’t tell you how gratifying it feels to know that in some small way I contributed to freeing Michael to explore his own personal visions. Over the seven years I developed the original MW.com, it evolved from fan-site (version 1.0) to a deep catalog of images with secure online ordering for his reproductions (version 2.0). But by 2003, life began to pull me away. My career in books left little time for the site. Sadly, I was away until 2009, when it was clear that the book industry was changing too rapidly for bookstores to keep pace. A stable career with a beloved company turned all too quickly into an untenable situation. But as they say, one door closes…So I went back to designing websites professionally after leaving Borders, which allowed me to stay at home with my son. Re-evaluating what I’d been doing over the last decade led to the realization that there was a gaping hole in my life. I found myself yearning for creativity lost in the corporate grind. I finished that novel I’d been working on, and I got in touch with Michael and his wife Audrey. Their site (version 4.0) was starting to age. I helped troubleshoot technical issues and even dabbled in customer service, but in the back of my mind another grand notion was gaining momentum. Web development had come a long way in 5 years. I knew there was more we could do to unlock the potential of Michael’s site. Quietly I started to lay the groundwork for a new, more user friendly site. With a nearly complete build (version 5.0), I flew out to Connecticut in June 2012 to discuss my vision with Michael and Audrey. Unfortunately, I made the mistake of showing off a site I was just finishing for C.S. Friedman, author of coincidentally enough CROWN OF SHADOWS among other books for which Michael had illustrated covers. That set an even grander notion percolating in Michael which would become version 6.0 (alas 5.0 never saw the light of day), a site with full-screen backgrounds to match the “wow factor” of the author site I’d just showed him. 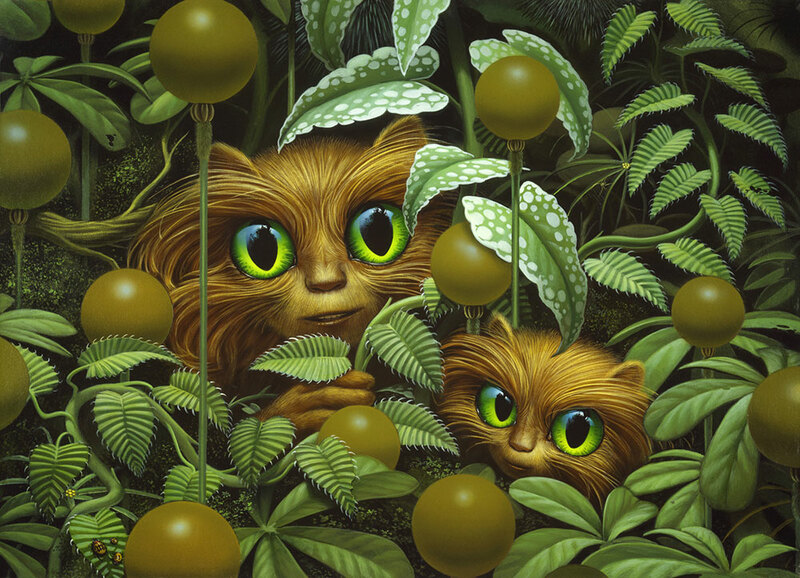 I headed back to California with a lot of work to do, melding Michael’s growing vision with my own—oh, and also with a signed print of Peekaboo Fuzzies for my son. We hung it in his room on the wall adjacent to Sentinels. Every once in awhile I’ll glance at that old poster and reminisce on what a strange and fulfilling voyage it began.